Control Panel is the main access point to all features. Main menu: navigation tool to access all back-end features. Social Meter: a graphical representation of the latest processed and waiting requests and posts. In a glance, the general status can be known. Shortcuts to the main channels and features. 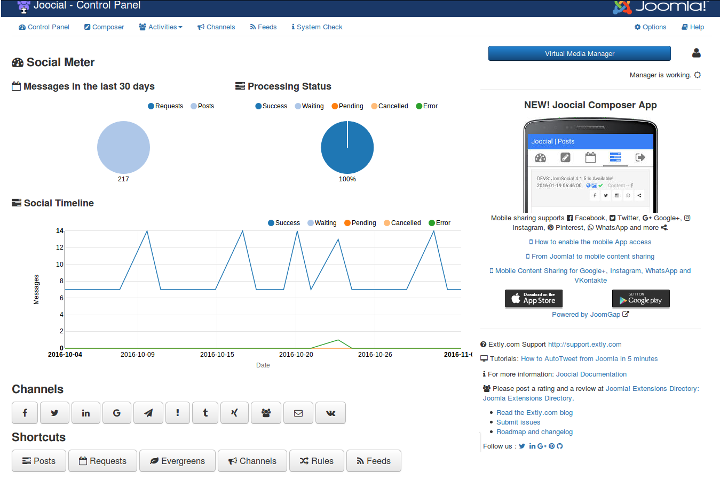 Joocial: Access to the Virtual Manager. Access to Extly Customer Support and other resources. In Control Panel, new releases notices are occasionally shown.